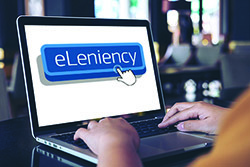 eLeniency is a new online IT tool designed to make it easy and less burdensome to submit statements and documents to DG COMP. eLeniency is available at: eleniency.ec.europa.eu. eLeniency is open to companies and to the lawyers representing them as part of antitrust and cartel proceedings run by DG COMP. eLeniency is available in English but statements can be made in all 24 official EU languages. Companies and their lawyers can use eLeniency to file statements and submissions in the context of leniency applications (immunity from fines or reduction of a fine). eLeniency can also be used for providing replies to requests for information made under point 12(a) of the Leniency Notice. The system enables companies and their lawyers to type-in corporate statements directly online on DG COMP’s secure server and to upload supporting documents. All submissions are to be made in writing, with no recording of the statements. eLeniency avoids the need for companies or their lawyers to travel to DG COMP’s premises to dictate oral corporate statements. eLeniency is available online 24 hours a day, 7 days a week. eLeniency can be used as part of cartel settlement procedures for submitting documents, providing comments or making formal settlement submissions to the Commission. eLeniency can also be used to submit corporate statements, provide comments or make formal settlement submissions to the Commission in non-cartel proceedings under Articles 101 and 102 TFEU, where an undertaking cooperates with a view to acknowledging an infringement of competition rules. The eLeniency system provides the same guarantees in terms of confidentiality and legal protection as the traditional procedure. All data is transferred securely and can’t be copied or printed. Corporate statements under the Leniency Notice that are made via eLeniency are protected from disclosure. Statements or submissions can’t be saved. They must be typed in one go. Once a user starts making a statement or submission, the session remains open for 24 hours. For long statements that can take longer than 24 hours to type-in, fragmented statements with proper referencing are also accepted. Before a user formally submits and uploads a statement or submission to the eLeniency server, he or she can preview it and make corrections. The Commission can’t retrieve any statement or submission, or any supporting documents, until they’ve been formally submitted in eLeniency. Once a statement or submission has been uploaded to the eLeniency server, only the Commission can access it and no trace of it remains on the user’s computer. The user receives a timestamp confirming the recorded date and time of submission to the Commission. To access eLeniency the first time, users must first create an EU Login account (or use an existing EU Login account). An EU Login can be created for a law firm or individually (by lawyer or by partner). Users must then send an email to comp-leniency@ec.europa.eu indicating the email address linked to their EU Login account asking to have their EU Login registered with the eLeniency system. This ensures only authorised users have access. The registration of user requests will be done from 09.00 to 17.00 on weekdays. NB: As the registration process may require some time, companies and their lawyers are advised to register in advance before using eLeniency. Users are advised to follow the guidance for submitting supporting documents in eLeniency. eLeniency is part of a family of online digital solutions supported by the ISA2 programme that will be gradually set up in 2019 and 2020 to facilitate the sending of confidential documents (eTrustEx exchange platform), the processing of confidentiality claims (eConfidentiality) and of requests for information (eRFI). Use of the eLeniency system is voluntary. Companies and their lawyers can continue to make statements and submissions using the current oral procedure. The ISA2 Programme supports the development of digital solutions for the modernisation of public administrations. The solutions developed enable public administrations, businesses and citizens in Europe to communicate digitally saving time and costs for all parties involved.